London is renowned for being one of the world’s best cities when it comes to the arts and culture. London’s contemporary art scene is forever thriving with new artists and tourists travelling all over the world to study the subject. It truly is a city that seems to have a never ending supply of art schools, galleries and fairs. For example, in 2015 there were around 500+ galleries, 60+ art museums and institutions and 10+ art fairs, while £260 million had been invested in the Tate. But amongst all this creative noise, smaller spaces seem to get lost in the hustle of a thriving city. 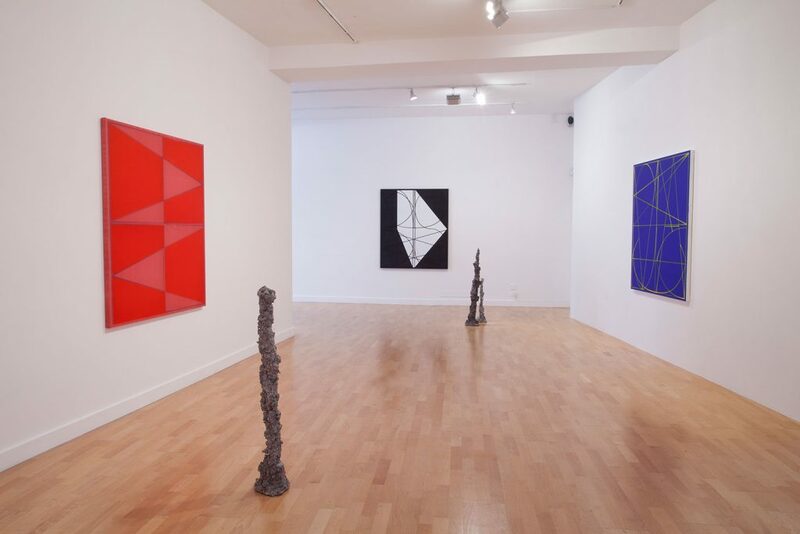 Listed below are 5 of London’s smaller galleries that exhibit a mix of modern and contemporary artists whose work ranges from sculptures to printmaking and even digital art. The Alan Cristea Gallery, first opening in 1995, displays a variety of contemporary artists, emerging artists and artists’ estates. The gallery is led by artists themselves and is worldly recognized for its contemporary prints and editions. The space is small which creates an intimate feeling when viewing the works, and the gallery’s bright lighting and white walls are undeniably inviting. 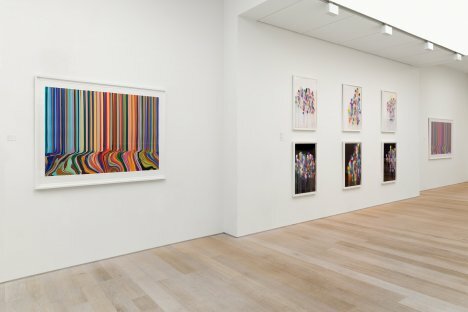 The exhibition currently showing here is Ian Davenport: Melismatic- a large collection of mono-prints and etchings. His work is inspired by the relationships between colour in the paintings of Holbein, van Gogh and Klimt. Davenport also works with rich tones, vertical lines and splatters of colour in his screen prints to create pieces that are loud and eye-catching. For a fans of printmaking, vibrant colour and large scale pieces, this exhibition is definitely a must see and is showing from 8th June 2017 – 31st July 2017. This gallery was founded in January 2000 and heavily focuses on conceptual and non-figurative art, whilst being repeatedly involved in international art fairs. It is the smallest of all 5 listed galleries, but this does little to diminish ones experience when viewing the art it has to offer. The curators of each exhibition displayed here are careful to make sure that the space does not feel too crowded, thus making the sure the emphasis is on the art itself. This deliberate utilisation of the space also ensures that the art- and visitors- can breathe despite the size of the gallery. Alan Johnson’s work is currently being shown at the gallery. The exhibition is made up of two parts: the first taking place at the Cologne Art-fair (April 2017) and the second at the Bartha Contemporary. In this exhibition he has works composed of multiple materials including acrylic, charcoal, plywood and linen. There is a naturalistic feel to his work, consisting of an earthy palette and minimal materials. For an exhibition that complies simple shapes, compositions and a mix of sculpture, painting and mixed media, Johnson’s work is a perfect fit. The exhibition is running until 8th July so there’s still plenty of time to see it for yourself. PACE London is one of a collective of galleries located around the world including New York, Hong Kong and Palo Alto. The gallery space boasts of a large room with white walls and polished wooden flooring. This, paired with windows lined at the back, make it feel large and open (it is in fact one of the larger of the ones listed). 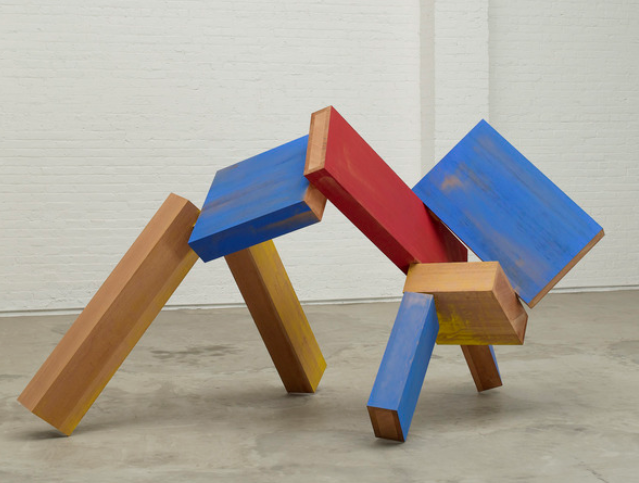 Joel Shapiro’s wooden sculptures are currently showing in PACE London. The exhibition comprises seven sculptures which are seen suspended and placed on the floor. There is a strong focus on geometry and colour in his pieces- with Shapiro seeing colour as a kind of force to be used to create meaning. There are also small gouache paintings featuring in the exhibition and this working with the sculptures, plays with 2D and 3D. The exhibition is on until 17th June 2017 and will attract those interested in bold colours, sharp forms and abstraction. FOLD Gallery has been open since 2012 and is well known for showing works supporting the emergence of new artists who deviate from traditional conventions. It focuses on bringing together international and UK artists to attract a broad range of visitors and show art such as painting and sculpture. The gallery space is situated in a type of basement which means that there is no natural lighting in the space. However, to compensate for this there is bright artificial lighting and white walls which create a more spacious atmosphere. Showing from 8th June-15th July is Nathaniel Rackowe’s Threshold which involves an installation piece as well as smaller and more intimate works. The installation work uses performance to encourage the audience to join in and explore the space. This, and the variety of materials used in the piece including glass, steel and florescent tubing, creates a visceral experience experimenting with ideas of intimacy and isolation. Those drawn towards multimedia, performance and a more sculptural approach to art will enjoy Rackowe’s art work. 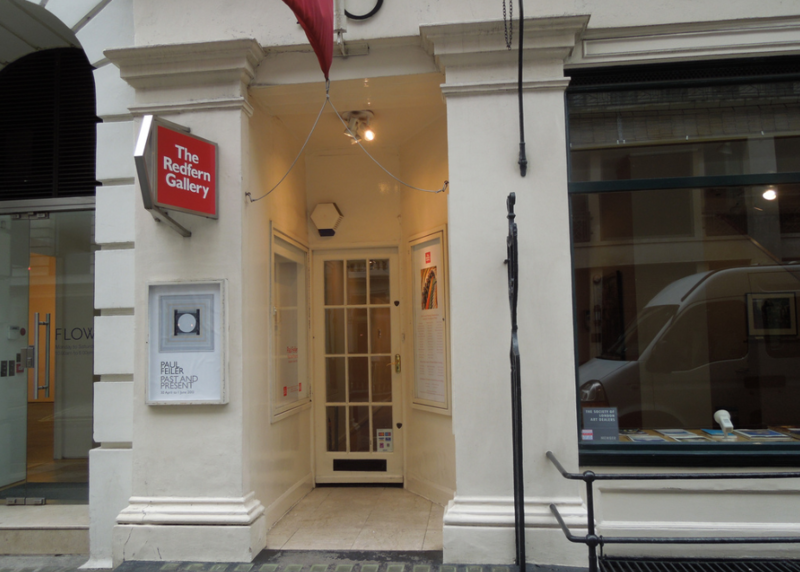 Founded in September 1923 The Redfern Gallery is well established as one of the longest Modern British and Contemporary art dealers in London. 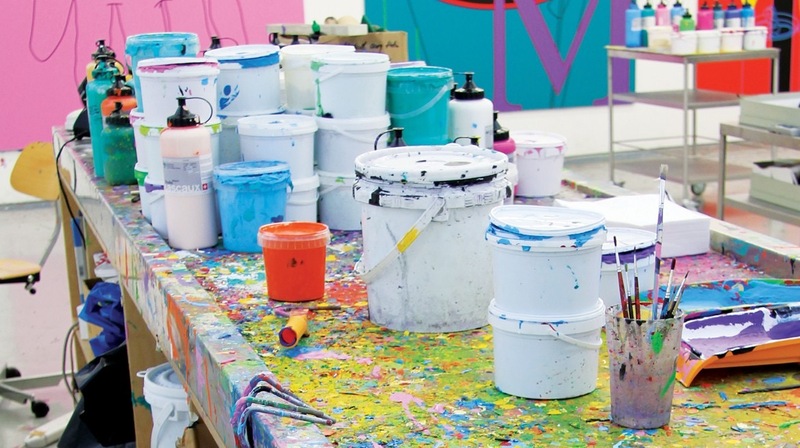 They now represent more than 30 contemporary artists and artists’ estates housing modern and contemporary painting, drawings, watercolours, prints and sculpture. Despite being small, The Redfern Gallery is more reminiscent of a larger, traditional gallery space with its multiple rooms and corridors. There is a feeling of familiarity within the space and the way that it houses more art in comparison to others listed makes it feel almost cosy. As a viewer you are literally both surrounded and consumed by the art. Since 8th March 2017, the gallery has been exhibiting Modern British Art incorporating painting, drawing and sculpture by artists such as Henry Moore and Jean Spencer. There is a large diversity of subject matter and style in this exhibition deriving from the multitude of artists being shown. With a little something for everyone, the exhibition is perfect for anyone- even those with only a small interest in art. So next time you crave a taste of London’s arts and culture, I would advise you to refrain from visiting the mainstream galleries and look a little deeper into London’s treasure chest of hidden gem galleries such as the five I have listed above. But don’t just take my word for it, why not visit and see their beauty for yourself? Make sure to let me know what you think!